PITTSBURG, Kan. – There was lots to see at the Robert W. Plaster Center during the NCAA Division II Indoor Track & Field Championships. When all was said and done, history was made and firsts were set. Six athletes made it back-to-back in their respective events on the afternoon after picking up titles a year ago. But of those six, three really set themselves apart from the pack. Academy of Art’s Mobolade Ajomale and Adams State’s Sydney Gidabuday entered their names into the NCAA Division II record book as they became just the second and third men to win a total of five individual event titles for their careers. Ajomale became just the second man in NCAA Division II indoor history to win back-to-back titles in both the 60 and 200. Ajomale won the 60 with a finish of 6.60 before picking up the 200 later in the evening in a time of 20.91. Gidabuday won the 5000 title on Friday night with a time of 13:56.99 before winning his third-straight 3000 on Saturday, crushing his own meet record with a time of 8:01.26. The two joins Tiffin’s Lamar Hargrove as the only men in NCAA Division II indoor history with five individual event titles. On the women’s side, Western State’s Alijca Konieczek had a stellar weekend. The senior posted her second-straight mile title with a time of 4:48.33, which was just over a second off her meet record run from a season ago. Later, she won her second-straight 3000 title with a 9:29.39 finish. During the first day of the competition, Konieczek helped the distance medley relay squad win the title, as well. Two other women made it a back-to-back affair. Adams State’s Dianna Johnson won the 60 with a time of 7.26, making her the fourth woman to win 60 meter titles in consecutive seasons. Alexis Zeis of U-Mary won her second 5000 title in a row, posting a winning time of 16:23.54. Ashland’s Myles Pringle annihilated the NCAA Division II Championship meet record in the 400 with a finish of 45.93, giving him his second-consecutive title in the event. His time broke a meet record set back in 2010. Also breaking a meet record on Saturday was CSU-Pueblo’s Thomas Staines, who posted a blistering time of 1:47.23 in the 800. Staines’ individual title was the first in NCAA Division II for the ThunderWolves. Fatim Affessi didn’t repeat, as she didn’t win titles a season ago. But she did make her presence felt at the meet, claiming the triple jump mark with a leap of 13.09m (42-11½) while the returning champion and fellow Lady Buff, Rellie Kaputin, finished third after winning the long jump on Friday. Like Gidabuday, Seedekie Edie of Lincoln (Mo.) also won his second title in three years. Edie claimed the long jump championship with a leap of 7.76m (25-5½), two years after winning the title in 2016. There were also a number of firsts, as a slew of programs picked up their first individual event titles. 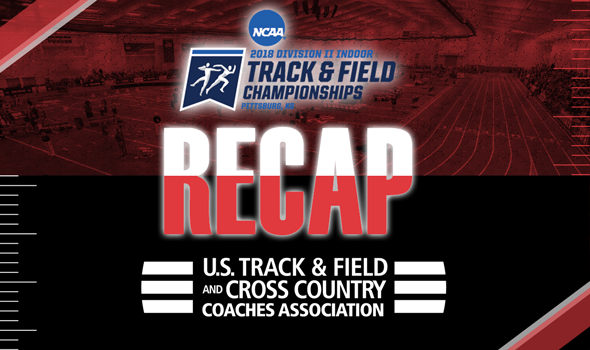 Colorado Mesa’s Spencer Jahr (heptathlon) and Nolan Ellis (men’s pole vault), Carson-Newman’s Tanner Stepp (men’s high jump), Central State’s Juan Scott (men’s 60 hurdles), Ursuline’s Janelle Perry (women’s 60 hurdles), Alaska-Anchorage’s Danielle McCormick (women’s 800), Millersville’s Sunflower Greene (women’s shot put) and Ariel Jackson’s of Lindenwood (Mo.) (women’s 200) all picked up individual titles for their programs. Each one marked the first NCAA Division II title for their respective programs in their respective genders.